We are grateful to Cole for sharing his awareness efforts with us from his college campus and encourage anyone experiencing similar issues to consider awareness through education as a tool to promote acceptance. Read Cole’s FULL Research Report Here. 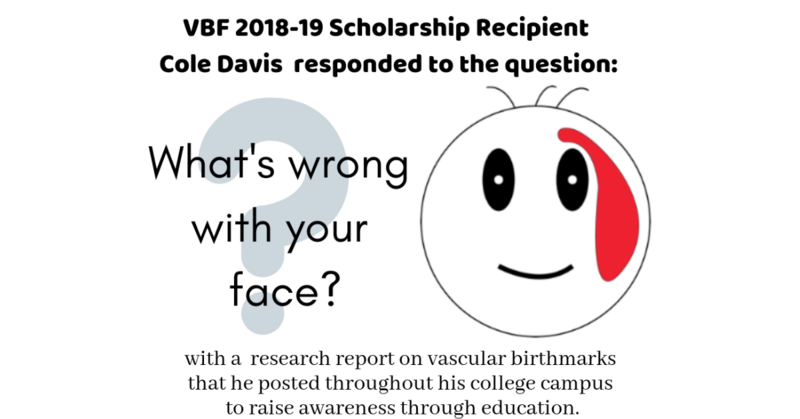 Check back for more Q&A with VBF Global Ambassador Manager Scott Cupples from VBF awareness leaders across the world depicting their life with a vascular birthmark. Our goal is to share real stories from those living with vascular birthmarks and their loved ones as part of Dr. Linda’s 2019 focus on the psychosocial aspects of life with a vascular birthmark.